Dr. Ron Parise - Co-Founder of Radio JOVE. Dr. Ronald A. Parise, one of the original Radio JOVE Project team members and a long-time friend and colleague of many of those on the Project, lost his battle with cancer on May 9, 2008. Ron helped guide Radio JOVE in its early years and developed the first dedicated software for it. It was primarily Ron who recognized the merits of using the soundcard approach to data acquisition vs the more expensive hardware approach of an analog to digital converter in the receiver. His insight into the best technique and his ability to make this approach work set the direction for Jove data acquisition - as implemented in his excellent JoveChart software. This software allowed the emulation of a chart recorder on the computer as a very inexpensive method of acquiring the data. This was one of the reasons why our first kits could be sold for $100. JoveChart and an accompanying spectrum viewing program influenced the "Radio-SkyPipe" software used today. Ron also helped answer the questions that we had about what equipment might be best for the radio design. Ron Parise was - and continues to be - an inspiration to countless students, ham radio operators, and friends the world over. His accomplishments were many, including: space explorer, pioneer, astrophysicist, pilot, ham radio operator, avionics and software expert, inspirational speaker and motivator, student satellite mentor, husband, father, and friend. While he certainly did some truly extraordinary things in his lifetime, Ron Parise is best known and cherished for keeping family and friends first.. and for this, we will miss him most. 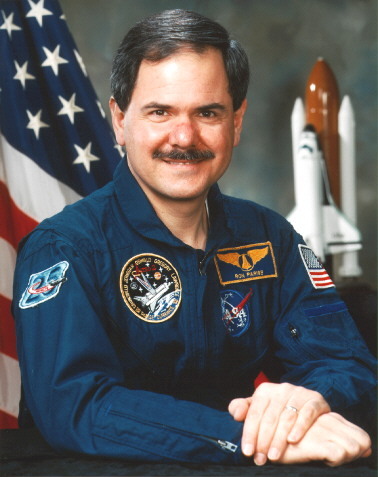 Ron flew as a payload specialist on two Space Shuttle missions: STS-35 on the Space Shuttle Columbia in December 1990 and STS-67 on the Space Shuttle Endeavour in March 1995. These two missions, called ASTRO-1 & 2 respectively, carried out Ultraviolet and X-ray astronomy observations. He logged over 614 hours and 10.6 million miles in space. Ron and his crew members on ASTRO-1 became the first astronomers to operate a telescope from space, making hundreds of observations during the mission. His personal contributions to these two missions have provided scientists with an unprecedented view of our universe, expanding our understanding of the birth, life and death of stars and galaxies. Ron (WA4SIR) was also the ultimate ham radio operator-in space and on the ground. First licensed when he was 11, Ron kept the amateur radio hobby at the forefront of everything he did-including his operations from space. During his two Space Shuttle flights, he talked to hundreds of hams on the ground, giving new meaning to the phrase the "ultimate DX-pedition". He was instrumental in guiding the development of a simple ham radio system that could be used in multiple configurations on the Space Shuttle. As a result, his first flight on STS-35 ushered in the "frequent flyer" era of the Shuttle Amateur Radio Experiment (SAREX) payload. He was the first ham in space to operate packet radio. His flight pioneered the telebridge ground station concept to enable more schools to talk to Shuttle crew members despite time and orbit constraints. In his two shuttle flights, he inspired countless students to seek technical careers and he created memories at the schools and communities that will never be forgotten. Ron's love for the amateur radio hobby and his love of inspiring students continued well beyond his two Shuttle flights. During the formation of the Amateur Radio on the International Space Station (ARISS) program, Ron was a tremendous resource to the newly forming international team. There were many instances where Ron's wisdom and sage advice was instrumental in helping our international team resolve issues when we reached critical technical or political roadblocks. He was also a key volunteer in the development of the ham radio hardware systems that are now on-board ISS. The ARISS team is deeply indebted to WA4SIR for his leadership, technical advice and tremendous vision. Ron worked hand-in-hand with the students at the Naval Academy and Embry-Riddle Aeronautical University on the development of their student satellites. He also spoke at numerous schools over the years, inspiring them to pursue careers in science, math and technology. In an effort to continue Ron's tireless work to inspire the next generation, the Parise family has set up a scholarship fund in Ron's honor. The scholarship is for students pursuing technical degrees at Youngtown State University, where Ron received his Bachelors of Science degree. Those interested are welcome to send donations to the Dr. Ronald A. Parise Scholarship Fund, Youngstown State University, One University Plaza, Youngstown, Ohio 44555. Ron was a great friend and supporter. His work will not be forgotten as one of the founders of the Radio JOVE project. Mihai Dumitru and his Jove antenna. 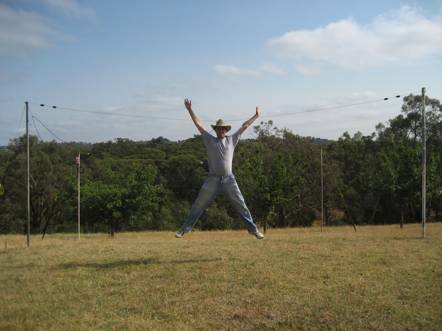 Mihai has compiled the following account of Jove radio astronomy projects in Australia. Perhaps not all inclusive - but certainly giving us a glimpse of many exciting programs. Mihai Dumitru reports that EDRO began with a 20.1MHz Jove radio telescope kit. Both solar bursts and Jupiter storms were recorded during the first month of operation which gave us a moral boost to start dreaming about future radio astronomy projects at this site. Live data has been available via Radio-SkyPipe or web (http://meljove.dyndns.org) since 2006 to all interested parties studying and comparing results with others around the world. The idea was to make these records public for a better event correlation between amateur scientists. Currently, we are running dual dipoles on 20.1MHz EW in-phase, and dual dipoles on 28MHz NS in-phase. This arrangement lets us compare events received by two systems running on two different frequencies and polarizations. Broadband, man-made interference is easily identified as we watch two frequencies at the same time. Our future plans include building an on-line spectrograph to monitor the RF spectrum between 18 to 30 MHz using a wideband antenna, a SDR-14 receiver and Jim Sky's spectrograph software. 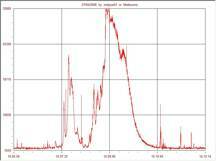 We expect to achieve detection of weak signals hidden inside the background noise using Digital Signal Processing techniques and auto-correlation and, to provide a stable and reliable real-time data source for amateur radio astronomers around the world. David Brodrick reports that this group continues to be active. Several years ago they configured two Jove receivers to operate as an interferometer (http://fringes.org). At present, the original 'Simple' interferometer is offline due to cabling faults; however, some exciting new developments are currently underway thanks to Christoph Brem, an engineer who came to Narrabri about 12 months ago. Christoph designed new receivers which produce two outputs separated by 90 degrees in phase. By combining these signals in software, it is possible to obtain the data for a single sideband of the detected radio signal. Although not necessary for standard Jove use, it opens up a new range of possibilities when two such receivers are configured to run as an interferometer. The complex data obtained is an important step towards being able to make images of the sky. Christoph has also purchased a 10-channel soundcard which allows many interferometers to be formed at once, another important step towards imaging. Steve McCauley writes that ACkRO was started in April 2007 by himself (a retired schoolteacher), Mitch Raitt (carpenter, electronics), and Cameron Moore (IT, electronics, teaching). The observatory is located 35 minutes north of Melbourne in the state of Victoria. The rural site has been provided by cosmologist and botanist Dr. John O'Connor and his wife Betty on their 20 acres of scenic farm and light woodland. It boasts a few hundred Eastern Grey Kangaroos, prolific bird life, two horses, and an earth return pole - right on top of a hill 162m above sea level and 51.5 km SSE of the Eric Dodge Radio Observatory (EDRO) run by Mihai Dumitru. Currently the ACkRO team is becoming familiar with radio astronomy gear and practices in order to successfully detect Jupiter and solar signals. Initially they will provide confirmation of signals, particularly Jupiter signals, for Mihai at EDRO. Later they intend to see what can be done with the combined data from the two sites. At the moment there are unidentified problems with the gear. 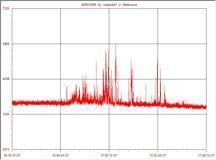 They have had only a few signals (Io A) which matched with EDRO (April 19th 2008), but the results are very promising. Steve was inspired by Mihai's detection of Centaurus A with a 4.6m dish at 1420MHz. Steve notes, "That radio light left Centaurus at the time of the Dryopithecines, an early ape, thought to be one of the immediate ancestors of H. sapiens. No humans were about then - or before - but a host of their genes were surely swilling about in the blood of the Dryopithecines." This project is funded through The Swinburne University of Technology Researcher Development Scheme (2006). Currently the project is complete in terms of the installation of equipment but will continue to be developed in the run up to the next solar maximum in approximately 2011. The Windward Community College Lanihuli Radio Observatory , (WCCRO), saw "first light" in 1999 with Richard Flagg and Prof. Joe Ciotti at the controls. Those were the early days of the Radio Jove Project. Since then, the observatory has grown in capabilities and now provides full time streaming of Radio-SkyPipe and Spectrograph data over the Internet. Some of the WCCRO data of special note has been submitted to the Jove Archive. We also save data in publicly available directories at the observatory. The Radio-SkyPipe server files can be accessed at http://166.122.43.82 using your browser. Spectrograph data is only saved when activated for specific Solar and Jovian events. You can access the Spectrograph data at http://166.122.43.81 . In addition to stored data, there are links on these mini-web servers to images of our most recent Radio-SkyPipe and Spectrograph charts. These are very handy for situations when you want to see our current data but only have access to a web browser. Did you know that you can search and download files from the Radio Jove Archive directly from your Radio-SkyPipe program? This is extremely handy for looking for correlations with your own data. From the File menu select Find in Jove Archive. A new panel will appear similar to the one shown below. Click the Reload Index button. This will download an index to all of the files available from the Jove Archive. You only have to download the index when you want to find something that was submitted since your last index download. After a few seconds of sorting the program is ready for you to begin your search. Select Jupiter, Sun, and/or Any for the types of observations you want to search. You can search using dates and times or place a word in the Search String box. Click the Find Data button and very quickly a list of matching files appears. When you click on the file in the list, buttons appear for grabbing the appropriate data types. These include Radio-SkyPipe files (SPD), sound files (WAV), Image files, and text files. Clicking on the button downloads the file from the archive and brings up the associated program to display it. For example a text file might appear in NotePad. Of course, SPD files are loaded directly into a chart and centered on a time if you specified one. See: http://www.radiosky.com/skypipehelp/find_data_in_jove_archive.html for more explanation. This works for all Radio-SkyPipe users; even the free version. The Radio JOVE team is pleased to announce the formation of a sanctioned Yahoo User Group. This was created for several reasons; it allows for lengthier discussions on a particular topic without clogging our email boxes, and it provides a way to archive these posts and replies for anyone to access. This forum will allow a specific question to be posted and answers or discussions of this topic in its own thread. This will by no means replace or supplant the Radio JOVE list server. That will remain in place. To join the group it is necessary to have received an invitation from a current member or request membership from the site. All new members must be approved by the Group Moderator. For the time being, or until someone else requests the job, the moderator will be myself. Once subscribed, if you do not care to receive separate emails, you can receive a daily digest or no notification at all. This should relieve some folks who want to stay in touch but feel overwhelmed by the amount of email that normally flows through the Radio Jove list server during Jupiter season and high solar activity. Since many of us are new to this type of forum, I hope you’ll bear with us while we learn together how best to utilize this service to the benefit of all our members. The lecture was done over the internet via Skype videoconferencing software with a connection from Goddard Space Flight Center in Greenbelt Maryland to UNAM. Translation of the talk into Spanish was provided by members of the school. A powerpont presentation was sent to the school and followed during the videocon. Not everything went perfectly as the movies in the powerpoint presentation did not work, but the students seemed to understand the content anyway as indicated by the wonderful questions they asked at the end. We look forward to working more with this dedicated group in joint observations and teleconferences in the future. This equation is strictly valid only if the resistor value is matched to the receiver antenna input impedance for the Jove receiver this would require a 50 ohm resistor. Let's calculate how much power is delivered to the receiver; given that the resistor is at 50,000 kelvins, and the bandwidth of the receiver is 6 kHz. (6000 hertz). At a radio-quiet receiving site this is about the amount of power from the galactic background delivered to the receiver by the Jove antenna (assuming there is no attenuation between the antenna terminals and the receiver). Because of this relationship between the noise generated by a resistor and the noise delivered from an antenna, it is convenient to describe the antenna signal in terms of antenna temperature. In theory we could replace the antenna with a resistor and vary the temperature of the resistor until its noise power matches the noise power from the cosmic radio source. When the noise power levels match we note the temperature of the resistor. This value of temperature is called antenna temperature. Instead of using a hot physical resistor we use a calibrated noise source — a device that generates a known amount of noise. While the measurement is usually made with the calibrator connected directly to the receiver, the actual antenna temperature should be referenced back to the antenna terminals — taking into account attenuation in the coax cable and other devices such a power combiner.